Welcome to our in-depth, detailed and extensive Go Pro HD Hero3 review. This is the latest offering from a dynamic company that started 10 years ago with a vision of creating the world’s most versatile camera, and I think they are just about there! The company is run by CEO Nicholas Woodman and around 300 employees, many of which are extreme sports fanatics. This is great as they are able to give hands on and credible feedback to each new camera as it is released. Also, check out any episode of Top Gear in the UK. You will more than likely see a Go Pro attached to one of the cars as it speeds around their track. Watch programmes such as "I'm a Celebrity Get Me Out of Here" in the UK. You will see contestants with them on their heads or chests. Even Felix Baumgartner had one strapped inside his space-suit when he leapt 128,100 feet back to Earth from space in October 2012. Interestingly, Go Pro cameras have now made their way into mainstream use as people like myself also use them. I do so to gain an advantage over my competitors when shooting weddings for example. This is by placing them in "hard-to-reach-with-a-normal-camera" places. I also have some crazy, inspirational and off-the-wall ideas for the future using my Go Pros. So, now you know who uses these cameras, let's talk a bit more about the camera itself. I am only going to review the Black Edition Go Pro HD hero 3 here as that is what I have. Please note though that there are two cheaper editions. The Silver and the White Go Pro's, that also have lesser specifications. Go to Go Pro's website for more information on those (personally, I would stump up the extra cash for the Black Edition…oh yes, I did)! My first thoughts when I took the Go Pro HD Hero from the box were "that is small"! I can’t believe that Go Pro have packed so much into this tiny little camera which is about the same size as a matchbox. It is now 30% smaller, 25% lighter and 2x more powerful and it shows. As a stills camera, and after taking a few shots, I can take it or leave it. Too random in its exposures and white balance for me although it works brilliantly as a time lapse camera. I would rather pick stills from footage and use those for the web than use the camera in most instances. I have found that you really need to shoot stills in a well and uniformly lit environment to get the most out of it. Point and shoot is too hit and miss for my liking. One of the first things I wanted to try, much like many who will buy this camera, was the 4k video albeit shooting at just 15fps. Also, shooting at 2.7k 30fps will be exciting as it will allow me to stabilize or crop footage and still get to 1080p resolution. Alas, the only Micro SD card I had at first was a puny 2GB class 6 card. This wouldn't allow more than a few seconds recording at these super high resolutions. I ordered and have now received a SanDisk Extreme Pro Micro SD Card card from Amazon and will be using that from now on. Next was the housing…very neat. Obviously smaller than the Hero and Hero 2 casings but now fashioned with a nice flat port for the lens. This will allow for much clearer, sharper footage underwater. After reading stories of how the old rear case once came undone and a naked Hero 2 fell to earth from 10,000 feet (and survived), I was pleased to see that there is now a 2-point mechanism for opening the rear door. Once you get used to it, it's a piece of cake and quite reassuring. However, admittedly I have never had a problem with the old housings. Next thing was to try the camera out real-time which leads me neatly into the rest of this hands on review. PRESS PLAY BELOW AND WATCH IN HD! I honestly think I could use this little camera for ad-hoc, quick blog entries without the hassle of setting up all my usual kit. What a bonus! Someone had previously asked if this was a genuine focal zoom or simply a digital zoom and crop. I can safely say, judging by the results, that the narrow view footage is almost as clear as the wide footage. Nice one! If you are doing time lapse, you only need to use the 5mp setting unless you really want the wide angle. As I have said before, the image quality when shooting stills from the Go Pro HD Hero 3 is a bit "hit and miss" depending on the light around you. This may be because I am a pro photographer and more used to the quality from the Canon EOS 5D range but it is unfair to make any comparisons. However, this camera does have a tiny sensor and packing 12mp into that sensor should tell you not to expect great things as a photographer from this camera. Interestingly, this is where the 4k Cine Pro Tune 15fps video comes in handy. Why not take footage of whatever you are shooting and then pull a still from it? After working on these pics below in Photoshop, amazingly the image pulled from HD footage was way better than that of the 12mp still! Look at the detail below with attention to the stone of the driveway. There is also a lack of purple fringing in the HD video frame grab. For me, the image pulled from footage is much more useable than the actual still image in some cases (which also has some purple fringing) as there is more detail all round…food for thought! The footage pull image is a little soft but using the unsharp mask a touch, it has good detail and produces a decent, useable photo. If you use a larger image size for time lapse, you have more room to zoom in and out during processing. This will give a great impression of camera skill and trickery even when the film is processed at 1080p. Nice. This is one of the main reasons I upgraded to the Hero 3…slow motion! I use slow-mo quite a bit in my work. After the disappointment of not seeing 1080p 60fps with the Canon EOS 5D Mark III when released, I was delighted to see it on the Go Pro HD Hero 3. I also shot a few clips at WVGA resolution (848×480). Using a frame rate of 240fps I then slowed it down 10x for super slow motion. Excuse the clip at the end, I couldn’t resist! Best watched at 480p on this page (it won’t play high resolutions). This was achieved by taking 30 images and then performing ancient skulduggery in Photoshop. Great pic! There is a lot of hoo-hah on the web as to whether these are useful or just a gimmick. Well, as you saw above, the 4k cine Pro Tune mode is good for pulling stills and also gives you 12fps. So, if you were at an event with fast action, you are better off shooting at 15fps 4k and pulling stills in my opinion. Using the 30 in one second mode mentioned earlier, produced somewhat darker images for me. I suspect this is because in order to get such fast fps, a fast shutter speed is needed which will produce darker images once the aperture is wide open in certain lighting conditions. I think. 2.7k at 30fps is much more usable but why I hear you say when we still only have 1080p TV's? Well, I for one, sometimes stabilize my footage in post production. By doing this, you need to crop out some of the image. When shooting 1080p footage, this means when I render out, I either need to render to 720p or lose some clarity and detail at 1080p. Shooting 2.7k and cropping still leaves lovely 1080p footage after stabilizing. The Go Pro HD Hero 3 now comes with Wi-Fi built in as standard…Yay! This means you can add the extra battery pack AND have Wi-Fi without having to make the compromise. The trouble with the Hero 2 was that I had to choose one or the other depending on the shoot. Of course, like its predecessor, you can also operate the HD Hero 3 via your Smartphone. Android or IOS. The waterproof remote control unit comes with the Go Pro HD Hero 3 so no extra purchase is necessary. However, the Hero 3 is substantially more expensive than the Hero 2. Operating the camera via remote is a cinch and so handy for many situations. You can just leave the Wi-Fi on and switch the camera from ON to OFF in a second or two. Having the Wi-Fi built in to the already tiny body will be a bonus for those wanting to keep the camera as small and light as possible. All I would like to see now is live streaming added as a possible firmware upgrade at some point. Like the top of the range Contour. PITA's? (Pain in the a**'s) - Battery life is poor because you are shooting more power hungry specs (higher frame rates etc). New cards required, and make them class 10 or higher. Larger resolutions and quicker frame rates won’t work so well with slower cards. New Micro HDMI cable needed to plug into your HDTV. Nothing much more to whinge about…great camera! Edit: Since writing this, I have found and bought a workaround regarding the battery power and can now get 9 hours or more from a single charge. Check out my review of the Anker Astro 5600 battery pack and charger. You want more? Ok. I think this is one of the most exciting and advance gadgets to hit the market in years. 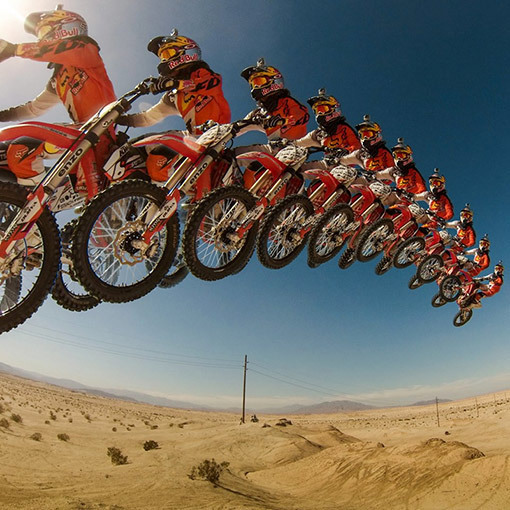 If you use your imagination a little, the possibilities are amazing (how about shooting 360 degree footage with 4 Go Pro’s?). Whether you are an extreme sports fan, amateur videographer or professional imaging geek, this camera should find its way into your kit bag at some point. It would be rude not to! Edit 2018: There are much newer versions of this cool little camera out now. Check them out at Amazon!